In a 2013 TED Talk, Bill Gates discussed the American school system and suggested that one of its key deficits was that teachers needed and were not being given real feedback. He argued that teachers needed real feedback from a range of peers and the opportunity to be able to learn from the best. Mr Gates used the term “real” to describe developmental feedback that is not linked to an accountability system. As an experienced headteacher who had recently moved to a new school on a journey of rapid improvement, this inspired me to review how we gave teachers feedback. Until this point, I had not considered video-based professional learning. I gave it a lot more thought, did some more research and after a couple of small trials I was sold on the idea that we could use video as a powerful tool to develop practice. Of course, as with any new initiative, there were the usual questions. How will we get staff buy-in? How will we get the most out of this initiative? How will we create the time to make this happen and keep teachers in class? What technology will we need? How will staff react and how will we get over the “cringe” factor of seeing and hearing yourself on film? All needed deep consideration. As did our investment in technology: we were going to need high-quality audio and visual equipment. I presented this vision for CPD to my governors and they agreed that we should invest in a commercial system. We emphasised the fact that the project was designed to be peer-to-peer and without heavy senior leadership involvement. Teachers would have control and ownership of their videos and others (including senior leaders) would only view them if the member of staff agreed to share: this is not Big Brother! Following the initial training session, staff were asked to film a lesson of their choice over the coming week and were then given the following staff meeting to watch their chosen video and self-reflect. We repeated this a few times giving more direction on the lessons to be filmed and a focus for the reflection. The power of this approach was very clear from the beginning. The stark reality of watching the videos and seeing the pupils’ reactions to body language, tone of voice and teaching styles gave a clarity to feedback that had never been present before. Staff could also see the immediate benefits and wanted to explore more. The next step in building trust and implementation was to share a video with a trusted colleague. We learnt that it takes about five to six times of watching yourself to move beyond the cringe factor and really start to focus on what is going on. We also learned that we needed to agree on feedback language and establish a contract with each other. Having secured staff engagement and contracted with each other, we moved into the next phase of more formal CPD using video for all staff. We still use this model today. Educator Daisy Christodoulou often talks about refining the parts to improve the whole and this approach has been key to the success of this type of CPD. An ideal recording is a maximum of 15 minutes and focuses on a single key element. For example, in an English lesson, we may just focus on modelled writing. The review sessions take place in staff training times. As a leadership team, we carefully select the peer review groups for each cycle to ensure that we have a mix of experience. This ensures that every teacher gets to watch every other teacher in the school across a year. 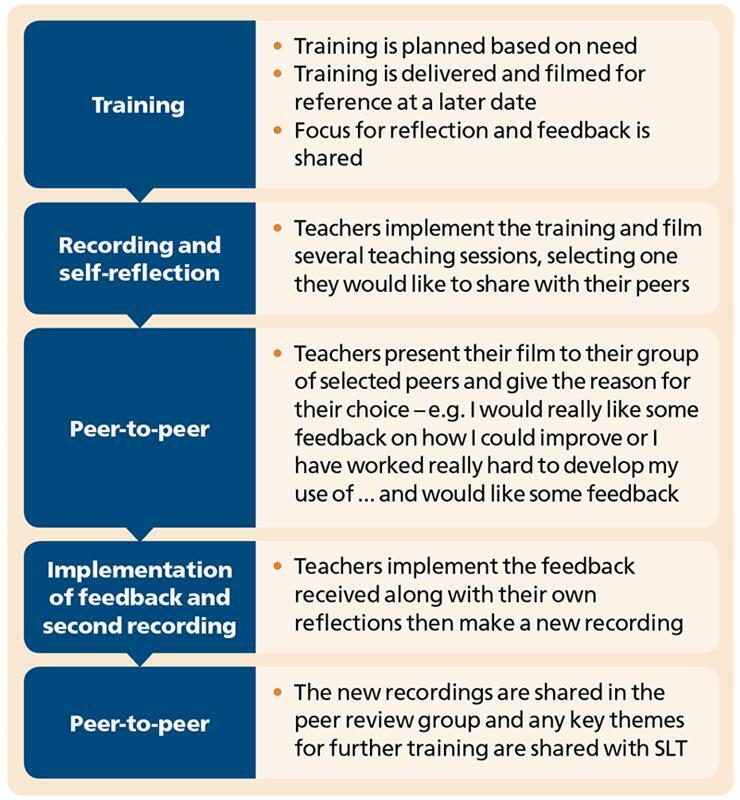 This sharing of practice has proved highly effective in improving the quality of teaching. Throughout the last five years, we have also built up a bank of videos which have been quality-assured and can be used for training. Our NQT package and induction of new staff includes opportunities to watch these films as part of self-directed CPD, but always as a tool to learn from and as a discussion point and not for staff to simply make cookie-cutter copies as that is never our intention. The impact of this approach to CPD is that staff feel empowered and take full ownership of their own development. They regularly set up peer review groups of their own volition. Teaching across the school rapidly improved and the school is no longer considered “vulnerable” by the local authority. In fact, we are now part of a Teaching School Alliance and have regular visitors to observe teaching. In July 2017, I was asked to take on the leadership of a second local school in the role of executive headteacher. One of my first actions was to introduce video-based professional learning there as well, but this time with the wisdom of five years’ experience. Now leading the two schools we have around 300 years of collective primary teaching experience at our disposal and that is very powerful. The peer learning groups now run across the two schools are especially powerful as our cohorts are very different. The leadership teams have also used the approach to improve their presentation and training skills using a similar process. High-quality audio and visual recording and playback. Structured and directed use within well-planned cycles of CPD. Explicit contracting around language used and professional behaviour. Dedicating time and resources to allow for high-quality talk about teaching. Access to a library of quality-assured best practice videos. Our next steps are to populate our new shared library platform with examples of great teaching videos for both schools to use as a CPD resource. I am also keen to look at how we might introduce pupil feedback in to the system to consider alongside the videos, to provide a breadth of real feedback. Ross Newman is the executive headteacher at Kings’ Forest Primary School and Staple Hill Primary School in Bristol. He is a graduate from the 2017 cohort of the Executive Educators: Leading several schools programme, which is run by Ambition School Leadership.